As the weather turns cooler and we prepare to say goodbye to the Summer/Fall CSA, here are 10 recipes to help you use your last couple of shares. Of course, if you are signing up for Groundwell’s Winter CSA, you’ll want to mark this page and come back to these! We’re focusing on beets, potatoes, squash, root veggies – all the produce meant to nourish us as we embrace fall. Preheat oven to 400. Place beets in a roasting pan with wine, a little bit of water, and garlic cloves. Cover with aluminum foil and cook until tender, about one hour. Once beets are done cooking, remove from oven and peel skin off while still hot. Cut into small pieces and cool. To make the dressing, whisk orange juice, champagne vinegar, honey, thyme, and salt and pepper together. Slowly emulsify in the olive oil. Before serving, mix the beets, onions and chard mixture, dressing, pecans, and goat cheese together. Serve at room temperature. Heat the oven to 400° F. Put the milk in a small heavy saucepan and peel and smash one of the garlic cloves. Add it to the milk and then heat the milk over low heat until it just starts to bubble at the edges. Remove from the heat, add the nutmeg and let steep while you continue with the recipe. Peel the second garlic clove, cut it in half and rub the cut side around the inside of a 6-cup baking dish no more than 2 inches deep. Rub 1 tablespoon of the oil all over the inside of the dish. Peel the squash, potatoes and parsnips and cut them into very thin slices (1/8-inch thick). If you have a mandoline, now’s the time to use it. Layer the vegetables into the baking dish, alternating between squash, potato and parsnip, and fanning them into concentric, overlapping circles. Season generously with salt and pepper and sprinkle a third of the cheese and a third of the chopped herbs over the slices. Repeat twice, making the top layer as neat and tidy as you can. Remove the garlic clove from the hot milk and pour the milk evenly over the vegetables. Drizzle the remaining olive oil over the top of the gratin and bake for about 50 minutes, until the top is browned and bubbly and the vegetables yield easily when you poke them with a sharp knife. If the vegetables are tender but the top isn’t as brown as you’d like, turn on the broiler for a couple of minutes — watch it carefully so it doesn’t burn! Let the gratin cool for at least 5 minutes before serving. In a large pot, cook potatoes with skins on in heavily salted boiling water until tender, approximately 15 minutes. Remove potatoes from pot, and peel them while still warm. Place potatoes in a large bowl and, using a fork, gently smash them, maintaining a fairly chunky consistency. Fold in minced shallots, lemon juice, olive oil, fleur de sel, and white pepper. Finish with parsley. Make the cupcakes: Heat oven to 350° (175°C). Line a cupcake pan with 18 liners. 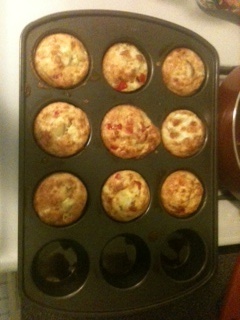 Add eggs, one at a time, to the mixer, scraping down the sides after each addition. Alternate adding the flour and milk mixtures, beginning and ending with the flour. Beat in the pumpkin until smooth. Scoop the batter among the cupcake liners — you’re looking to get them 3/4 full. 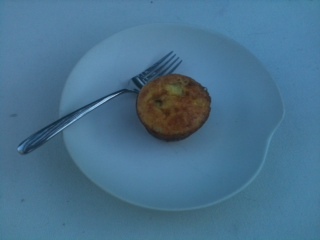 Bake the cupcakes until a toothpick inserted into the center comes out clean, about 20 to 25 minutes. Cool the cupcakes on racks completely. Make the frosting: In a stand mixer beat all the ingredients on medium until fluffy. Frost the tops of each cupcake, swirling decoratively. Refrigerate cupcakes for 30 minutes to set up frosting. While the vegetables roast boil a large pot of heavily salted water. Cook the bucatini until al dente. Drain the pasta reserving 1/2 cup pasta water. Add the rosemary and thyme to the pasta. Pour in 1/4 cup pasta water and cook over low until the pasta looks slick and the pasta water coats the noodles. Add more if needed. Remove the pan from the heat. Add the vegetables to the pasta. Toss to combine. Add the bread crumbs to the pan then cook until golden, about 3 to 5 minutes, stirring often. Add the pasta to a serving platter then cover with bread crumbs, freshly grated Parmesan and chopped fresh Italian parsley. Heat coconut oil over medium heat in large dutch oven or soup pot. Add onions and saute for about eight minutes, stirring occasionally so they get soft and golden. Add garlic and saute for another two minutes. Add diced tomatoes, tomato paste, green chiles, chili powder, cumin, oregano, cayenne, salt and pepper. Cook for another two minutes, stirring frequently. Add black beans, sweet potatoes and vegetable stock. Cook for 4 – 5 minutes, stirring occasionally. Add in quinoa and let simmer for 25 minutes. You’ll feel like there is a LOT of liquid in the pot, and this can’t possibly turn into chili, but it does. Stir every few minutes, to ensure quinoa doesn’t stick to the bottom of the pot. After 25 minutes, the sweet potatoes should be fairly tender, and quinoa should be cooked (if not, give it a couple of minutes more). Squeeze the juice of half of a lime on top. If your lime isn’t particularly juicy, squeeze the other half. Add your cup of corn. Give everything a good stir. Let simmer for a couple more minutes, until corn is heated through. Eat some, share some, freeze some. Top with avocado/guacamole, scallions and cilantro when you’re sitting down to enjoy a bowl. Put carrots into a small pot and cover with 2″ of water. Bring to a boil and then reduce the heat. Cover and simmer about 10 minutes, or until tender. Add 3/4 C. cashews and apricots to the pot and continue to simmer until the carrots become very soft, about 5 minutes more. Set a colander in the sink and a 1 cup measuring cup inside. Drain ingredients, reserving 3/4 cup of the cooking liquid in the measuring cup before draining completely. Be careful when reserving the hot water, use an oven mitt while you hold the measuring cup. Put drained carrot mixture and 1/2 C. of reserved cooking liquid into a food processor and puree until smooth. Check consistency and add more cooking liquid if you like. Scrape the sides of the food processor bowl to make sure all ingredients are incorporated. 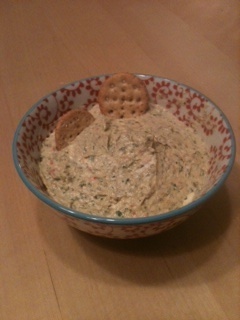 Chill for at least one hour and spread onto your favorite crackers, pretzels or veggies. Garnish with extra cashews, if desired. Weeks 14 and 15: 10 Recipes for Autumn! The air is chilling, the first batch of applesauce is cooking and we are eagerly looking forward to winter squash. Soup is the most frequent thing on the stove and we’re soaking up every bit of the sun as it sets earlier and earlier. In our house, the flavors and kitchen decisions start to turn a bit towards casseroles, stews and roasted veggies. It just feels appropriate, almost all of a sudden! Saute onions/leeks, carrots and celery for 8 – 10 minutes, until starting to soften. Add potatoes and season with salt, pepper and cayenne pepper. Stir and saute for another 5 minutes or so. Pour in the broth and bring to a boil. Reduce the heat to a simmer, and let it cook for about 10 – 12 minutes. The potatoes should be tender at this point. (I usually remove a potato and eat it to test, burning my mouth in the process. Very technical over here.) If the potatoes are not tender, keep simmering, checking every couple of minutes. Slowly add the milk, stirring as you go. Add the arrowroot powder and mix it in. This will help to thicken your soup. If you have an immersion blender, now is the time to safely move your soup pot to a spot where you can use it. Please be careful, so you don’t splatter and burn yourself. If you don’t have an immersion blender, no problem. Safely blend somewhere between half and three-quarters of the soup in a regular blender, and return to the pot. Add your celery leaves and half-and-half and give it one final stir. A note about the celery leaves – this is for those vibrant green leaves with amazing flavor that you get from the farmer’s market (or your lovely CSA, Groundswell!). If your celery doesn’t have leaves, parsley would be a great alternative! If needed, add a little more salt and pepper. 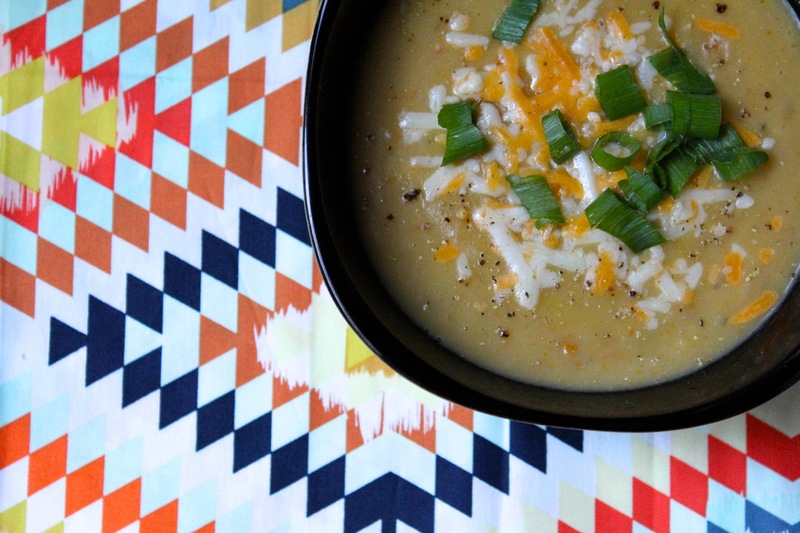 Ladle into soup bowls and garnish with scallions or chives, and a sprinkle (or in my case, giant handful) of sharp cheddar cheese. Happy soup season! In a large pot, add the coconut oil, onion, garlic, curry powder, tumeric, chile flakes and 1/8 teaspoon of sea salt and heat over medium heat. Once the onions start sizzling, turn the heat to low and cook 4-5 minutes, stirring often, until onions are soft. Add 8 cups of water, lentils and 2 teaspoons of sea salt. Turn heat to medium low. Use a wooden spoon to scrape up any bits of onion or seasoning that started to stick to the bottom of the pot. Put the lid on the pot and simmer for 30-40 minutes, stirring occasionally, until lentils are soft. Taste to see if additional salt is needed. Stir in coconut milk and chopped kale. Cook until the coconut milk is heated and kale has wilted a bit. Taste again for seasoning and adjust with salt if necessary. Prep your broccoli: Wash broccoli well — seriously, there is always a stem-colored worm hidden in the florets when I buy organic or from a farmer’s market, hooray for fewer pesticides! — and pat dry. Slice straight through the broccoli stem(s) as close to the crown of florets as possible. The crown should naturally break into several large florets, and you can cut these down into more manageable chunks. I find that less mess is made and less broccoli rubble is lost when I cut not down through the florets tops to halve chunks but up through the attached stems. (See 2nd photo above.) After cutting through the stem, I use my hands to break the floret the rest of the way in two. Don’t let the stems go to waste. I peel off the tough outer skin and knots and cut the stems into 1/2-inch segments; they cook up wonderfully this way, and at the same speed as the florets. 1. Preheat the oven to 350′. Cut the tomatoes and the half of an onion into wedges. Use your finger to push out some of the seedy parts of the tomatoes, but this is not a huge deal, just get out the big seedy parts, a bit intact is fine. Spread them on a rimmed baking sheet. Drizzle with the olive oil and sprinkle the salt, a generous amount of pepper, the chopped parsley and gently toss it with your hands. Tuck the garlic cloves somewhere in a tomato, so they don’t burn. Roast on the middle rack for 30-40 minutes until the tomatoes have broken down and reduced to about half their size. Remove and cool slightly. 2. Warm the broth and stir in the tomato paste to dissolve. Add the all of the ingredients from the roasting pan into the broth and let it gently simmer for 5-10 minutes. Use an immersion blender to puree the soup in the bowl, or with a food processor or blender. The soup should be smooth, with some texture. If you don’t like any texture at all, you could run it through a fine mesh sieve. Return it back to the pot, and add the cream to taste, if using. Taste for salt and pepper. Transfer to a wide serving bowl. If there’s enough leftover cooking liquid to be bothersome, simply use a slotted spoon to leave the amount you wish to behind. Drizzle farro lightly with additional olive oil, scatter with basil and parmesan. Eat immediately. Repeat tomorrow. Preheat the oven to 425F. Trim both ends of each beet and wash well. Place a few beets on a large piece of tin foil. Drizzle with oil and wrap up. Do the same for the other 3 beets on another sheet of foil. Place on a baking sheet and roast for 45-75 minutes, until a fork pricks through fairly easy. Check beets after 30 mins of roasting, and every 15 minutes thereafter. Cooking time will depend on the size…mine took 60-75 minutes. With oven mitts on, carefully open the tin foil and allow to cool for 5-10 minutes. Now peel off the skin and discard. Slice beets into wedges. While the beets roast, prepare the citrus. De-pith and slice into segments. Set aside. Reserve the scraps of juicy flesh as you can use this to squeeze into your dressing. Blend the dressing ingredients together in a processor. I used my mini processor and it worked well. Adjust seasonings to taste, adding more sweetener, juice, or salt if desired. To assemble, add greens (I used a mix of blanched beet greens and baby romaine), followed by the beets and citrus segments, top with nuts, seeds, and/or cooked grains, and finally the dressing. http://www.groundswellfarm.org/wp-content/uploads/2018/01/Pumpkin.png 889 1012 Steve Whittington http://www.groundswellfarm.org/wp-content/uploads/2018/02/Groundswell-Farms-Logo-v6-1030x321.png Steve Whittington2015-09-21 09:02:292018-03-23 11:52:17Weeks 14 and 15: 10 Recipes for Autumn! We’ve now gotten to the point where bringing a bag to CSA pick-up certainly isn’t sufficient! When I bring two baskets and a couple of smaller bags, all of our beautiful, fragrant veggies and herbs still burst through the top. We are making and storing pestos from past weeks ‘ recipes with the beautiful basil, enjoying fresh salads and snacking on raw carrots, cucumbers, peppers and tomatoes when we head to the beach. This week includes a chicken stir-fry, an asian noodle salad that we always do some version of a couple of times each summer, a great way to use green beans and fennel, a kid-friendly snack and vegan chocolate-zucchini muffins. Let me know what you’re making and loving! Assemble your salad: Toss green beans with most of fennel, all of celery and half of the pickled red onions. Sprinkle two tablespoons of the red onion pickling liquid and two tablespoons of olive oil over the mixture. Season generously with salt and pepper. Taste, adjust seasonings and ingredient levels to your preferences. Combine all the ingredients in a large bowl, stir well to combine (add more flour if it’s not binding). Season with sea salt and black pepper. In a large skillet,add three tablespoons of oil to the pan on medium heat. When hot, add tablespoonfuls of the bean mixture. Fry on one side until golden brown and crispy (about 3 minutes). Flip over for a further three minutes. Remove and drain on a paper towel. Season with fresh black pepper and sea salt. http://www.groundswellfarm.org/wp-content/uploads/2018/02/Groundswell-Farms-Logo-v6-1030x321.png 0 0 Steve Whittington http://www.groundswellfarm.org/wp-content/uploads/2018/02/Groundswell-Farms-Logo-v6-1030x321.png Steve Whittington2015-08-16 22:12:272015-08-16 22:12:27Week Ten: Colorful! Week Four: Roasted Carrots, Summer Smoothie, Bento Bowl and More! I am really enjoying the beautiful, delicious produce we’re receiving this year, as I’m sure you are! It’s always fun as the variety continues to grow! I hope you enjoy this week’s recipes. If there is a specific ingredient you’d like a recipe for, or you’ve really enjoyed one of the recipes, please feel free to share in the comments! I want to make this space as useful as possible for you all. Trim the stems off the carrots, leaving a couple of inches of the stem intact. Wash the carrots and gently pat dry. Peel, or leave as is, based on your preference. Place carrots on baking sheet. Drizzle carrots with oil and roll them on sheet until oil is evenly dispersed. Sprinkle with salt, cumin seed, coriander seed and pepper. Space out 1/2 inch or so on the tray. Roast carrots for 15 – 20 min, or until they are just fork-tender but still a bit firm. Be sure not to overcook. Make the tahini sauce while they are cooking by whisking all ingredients together. Plate carrots and drizzle sauce on top. Any leftover sauce can be served on the side for dipping. Layer kale, yogurt, chia seeds, honey, banana and frozen berries in blender with water. Blend on high until well-mixed. Enjoy! Bring a large pot of water to a boil for the noodles. Drain and press the tofu. Cut it into cubes and saute on medium heat with 1 tsp. sesame oil until lightly browned. Be gentle so the tofu stays in cube form. Start the sauce. Saute the the garlic and shallot in the oil to soften, whisk in the peanut butter, coconut milk, water, agave and soy sauce and mix to combine. Sprinkle in the red pepper flakes. When all ingredients are warmed through, add the lime juice. Add spices as you wish here. In a steamer basket, or pan filled 1” with water. Steam the bok choy, scallions and bell peppers for 6 minutes with the lid on (time may vary). Remove. Cook the noodles according to instructions. Drain and drizzle a little sesame oil to prevent them from sticking. Mix the tofu with desired amount of sauce so it looks like a creamy mess. Lay the tofu on top of the noodles and arrange the bok choy, peppers, cucumber, pickled ginger and shaved carrots along side. Sprinkle everything with sesame seeds and fresh chopped cilantro. http://www.groundswellfarm.org/wp-content/uploads/2018/02/Groundswell-Farms-Logo-v6-1030x321.png 0 0 Steve Whittington http://www.groundswellfarm.org/wp-content/uploads/2018/02/Groundswell-Farms-Logo-v6-1030x321.png Steve Whittington2015-06-28 21:15:122015-06-28 21:15:12Week Four: Roasted Carrots, Summer Smoothie, Bento Bowl and More! Hello members, welcome to week 14. This week we have a pork roast with salsa verde, but also four recipes that are vegetarian/vegan friendly. Two recipes make use of slow cookers, and one is a “all-in-one-pot” recipe for families who will be starting school this week. Enjoy! Grill or roast the zucchini in strips ahead of time, about 15 minutes cooking time. Wrap them in foil after done to steam them for a few more minutes. When cooled, place zucchini, along with other ingredients in a food processor. Puree until relatively smooth. Transfer to a serving bowl, make a little well with a spoon in the middle to drizzle the olive oil into. Serve with sliced veggies, pita chips, or more zucchini strips (so meta!). Spray a medium size crock pot with cooking oil. Place the roast in crock pot, season with salt and pepper. In a medium saucepan heat 2 Tbsp oil. Add onions and garlic and cook until transparent. Add salsa verde and oregano to pan, stir. Put tomatillos in blender with just enough water to cover them, blend until liquified. Pour the onion, salsa, oregano mixture over the pork roast. Pour the blended tomatillos over the park roast. Cook on high for one hour, then change to low for 6 hours. Shred pork with a fork and cook on low for one more hour. Serve pok in your favorite taco shells with your favorite toppings. When I used to work at Groundswell, Tom and I would discuss the finer points of life, including how to make tomato sauce. Tom told me you can put whole tomatoes in a slow cooker overnight without the lid on. At first I didn’t believe him, and said “No way!” and he said “Way! Now get back to work!” I think is how the exchange went. So that night I went home, took some tomatoes, and a slow cooker, and made my first batch of tomato sauce that I would freeze. wash the tomatoes, peel or cut any bad spots out, and the core if you want. 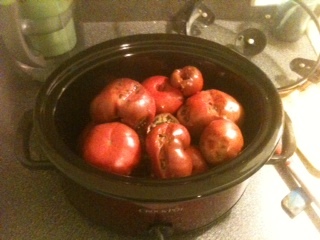 Place the tomatoes in the slow cooker, stacking as many as you can. 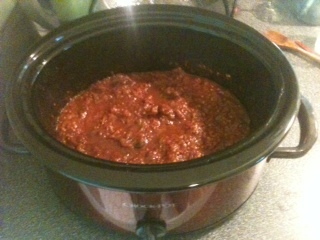 Turn the slow cooker on low, with the lid off, and leave overnight. In the morning you can mash the tomatoes with a masher and leave them to cook more, or transfer the tomatoes to a stock pot on the stove. Cook the tomatoes down on either the slow cooker or stove top. Use a hand mixer to blend up the skins and seeds, or put the sauce in the blender/processor to blend up the skins/seeds. When you have a sauce consistency you like, let it cool for a few minutes, then pour into quart bags, close carefully, and freeze. This winter, when you need tomato sauce, grab a bag of frozen sauce, reheat, add dried herbs, and enjoy! Bring a pot of lightly salted water to boil. Add green beans and cook until crisp-tender, about 3 to 4 minutes. Whisk yogurt, mayo, vinegar, salt and pepper, and garlic in a mixing bowl. Add the green beans, tomatoes, and cheddar to dressing bowl, toss. In a large pot, bring all ingredients (except for basil, spinach, and parmesan) to a boil over medium-high heat, stirring frequently to prevent sticking. Continue to boil pasta until al dente, about 9 minutes for linguini. Stir often. Add basil and spinach, cook one more minute until greens begin to wilt. Serve in bowls, garnish with parmesan and more basil. Here are four easy recipes to make, and a Caprese salad recipe to get excited about tomatoes that are starting to come in. Beans, zucchini, tomatoes, the share just keeps getting better! Tear the lettuce into bite size pieces and place in a large salad bowl. 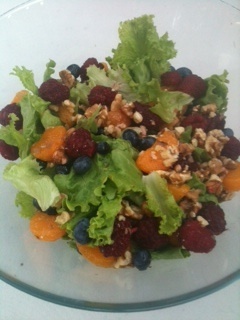 Add blueberries, raspberries, and mandarin oranges to your liking. Start with a 1/4 cup of each and add more if desired. Break walnuts into small pieces, sprinkle on top. On the left, a freshly poured egg roll. On the right, a flipped egg roll finishing frying. 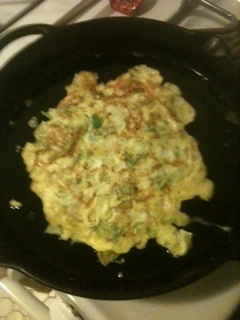 Put half the cabbage, onion, and garlic in a mixing bowl, add 2 eggs and mix. When the skillet is hot, pour the mixture in, it should make a somewhat lumpy pancake shape. Cook for 4-5 minutes on one side, then flip and cook another 4-5 minutes. 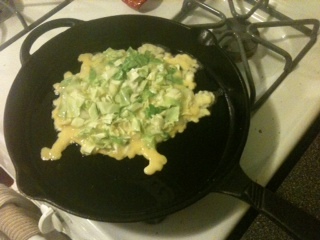 While the first one is cooking, mix the remaining cabbage, onion, and garlic with eggs. Transfer the first one to a plate with a cover, fry the second one using the above directions, then take both to the dinner table for an easy comfort meal. Arrange lettuce, tomatoes, avocado, mozzarella, chicken, and basil on plates (however many are coming to dinner). drizzle with a simple vinaigrette of olive oil and balsamic vinegar. Bring a pot of water to boil, add green beans and onion and cook for 3 minutes. Transfer the beans and onions to a bowl of water and ice for 5 minutes, drain and pat dry. 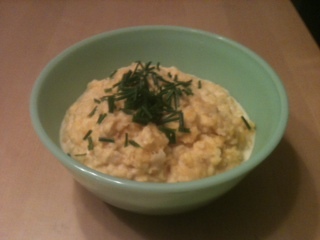 Whisk the eggs in a bowl, then add olive oil and milk. Add salt and pepper, then corn meal and 2 Tbsp of the cheese and mix. Fold in the beans and onions, mixing well. Pour mixture into a greased baking pan, and bake for 40 minutes. Take pan out, and remaining 3 Tbsp of cheese, then bake for 5 more minutes or until cheese top is melted and golden. If you go to Fulton Street Farmer’s Market, be sure to check out Ham Family Farm for sweet corn. They grow two popular varieties, “Dutch Love” and “Irish Love” and you can usually find a line of people at 9 am waiting for a delivery fresh picked from Allendale. Heat olive oil in a large skillet over medium high heat. Add garlic and stir frequently for about 1 minute. Add zucchini, corn, basil, oregano, and thyme. Cook, stirring occasionally, until zucchini is tender, about 3-4 minutes. Season with salt and pepper, stir in lime juice and cilantro. Sprinkle with parmesan.